The finale to SEGA's RPG saga — and the first to be released in the West — is great, if you don't mind being seated during the third act of a movie. I've been waiting seven years for the 7th Dragon series to finally make its way to the U.S.; now that it has, my only real complaint is that SEGA waited until the very final chapter of the saga to make their first localization effort. The games have until now been victims of poor timing. The original 7th Dragon hit in 2009, right around the time the DS market collapsed in the U.S. and publishers began abandoning the system in droves. Its first of two PSP sequels hit in 2011, long after all but the most courageous companies had given up on the idea of selling PSP games in America. Thankfully, the series' one and only Nintendo 3DS entry managed to squeak by just before the looming deadline of obsolescence for that system, and better late than never, I suppose. You don't need to be familiar with the previous games in order to follow 7th Dragon III's storyline — certainly you'll get more out of it that way, but the script tidily explains its plot connections to its predecessors as it goes along. All you really need to know is that there are seven True Dragons throughout history that seek to destroy mankind by spreading deadly flowers that turn the air into a poisonous miasma, and your team's mission is to travel through time to destroy them and save humanity once and for all. In the beginning, 7th Dragon played like a cross between a traditional Dragon Quest-style console RPG and Etrian Odyssey, which makes sense given that it was created by Phantasy Star designer Reiko Kodama and Etrian Odyssey director Kazuya Niinou. The latest game doesn't boast quite the same star-studded lineup; Niinou has since moved along to Square Enix to work on Final Fantasy XIV and Dragon Quest Builders. As such, the game's overall design has evolved somewhat so that its systems work less like a direct copy of Niinou's previous creation. You can definitely see how 7th Dragon III's mechanics could have come from Etrian Odyssey if you squint, but the series has really become its own thing. 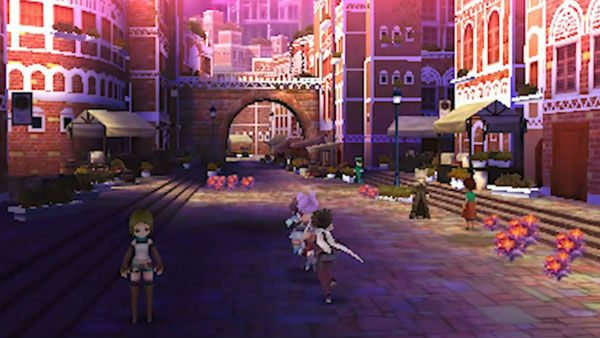 The central concept of the game still carries a strong connection, though: The dragons you fight along the way are very, very similar in nature to Etrian Odyssey's F.O.E.s. They don't appear as random encounters, as with standard enemies, but rather as icons roaming the field map. They tend to be considerably more durable than random foes, too, with increasingly devious battle tactics. And if you happen to enter a battle with a dragon nearby, it will join the fight after a number of turns, potentially transforming an extended battle into a truly epic one. There are more than seven of them, despite the game's title; the eponymous seven dragons are the True Dragons, the end-boss-level foes. But there are about 250 of the other lesser dragons you have to deal with along the way, and each of those fights requires a well-honed team. Thankfully, 7th Dragon III is a far friendlier experience for players than the original entry (which I've been told ended up being passed over by several U.S. publishers due to its crushingly high difficulty level). In fact, "user friendly" defines 7th Dragon III. It contains quite a few complex game systems and some truly brutal fights — the rare, climactic True Dragon battles will destroy you repeatedly until you perfect your strategy — but it also goes out of its way to minimize your frustration. While you're limited to a three-person combat team, you can travel with up to two back-up parties. These reserve members can't be rotated in to fight during a battle a la Final Fantasy X, but they gain experience and skill points at the same rate as lead party members, which means you don't have to waste time grinding for experience with newcomers; they'll get up to speed on their own. More importantly, reserve teams can be called on as a battle progresses to execute special actions, some of which can be life-saving. For example, dragons have a tendency to charge up their power for a devastating super-attack the following turn. Rather than waste a turn defending, it might be better to call a reserve Rune Knight into action to use its support ability to null the enemy's status boost and reduce its super-attack to a normal action. Or, then again, maybe you should ride out the dragon's boosted attack and call on an entire reserve team to issue multiple simultaneous support actions in the next round, up to and including resurrection, healing, and buffs. Where the original 7th Dragon more or less carbon-copied its character classes from Etrian Odyssey, this sequel includes more unique classes — some of which are pretty great. Maybe too great; I had a hard time shifting away from my initial team of Godhand, Agent, and Samurai as new jobs unlocked. The Godhand excels in building cumulative damage and "tagging" foes to enable powerful follow-up attacks, while the Agent possesses incredible support skills, including the ability to respond to every enemy attack during a turn with a powerful counter or "hack" enemies to steal mana points for the entire party. Agents have great synergy with heavy-hitting Samurai, as they have access to a status debuff that complements the Samurai's ability to imbue their own attacks with fire elements. And each of the other five classes offers equally interesting options, turning combat into much more than simply trading blows — standard attacks are much weaker than special attacks, many of which cost little mana. If I have a complaint about the combat system, it's that it's balanced for the dragon encounters and the need for high DPS. As a result, the tactics that become essential as you fight those roaming boss-level monsters make random battles almost trivial. Classes that rely on status effects and long-term tactics to excel, like Duelist and Fortuners, are great in dragon battles but become a liability in standard encounters. This seems to be a side effect of the game's drive toward accessibility, which in some respects is admirable (you never need to wonder where to go next when you jump back into the game after a break, since you have a menu option to point you to your next objective) but definitely undermines the utility and value of certain tactical options. Despite these issues, and despite being the final chapter of a story that until now has only been playable in English through illicit means, 7th Dragon III is an easy recommendation for RPG fans. The 3DS hasn't lacked for great role-playing experiences, and this ranks among the best. It's a great-looking game with interesting customization options, excellent music, a solid story, and lots to do and develop in the near-future Tokyo Midtown building that serves as the player's base... including visiting a cat cafe. A lot of heart and a lot of effort went into this RPG, and while it does have a few shortcomings, the good easily outweighs the mediocre. 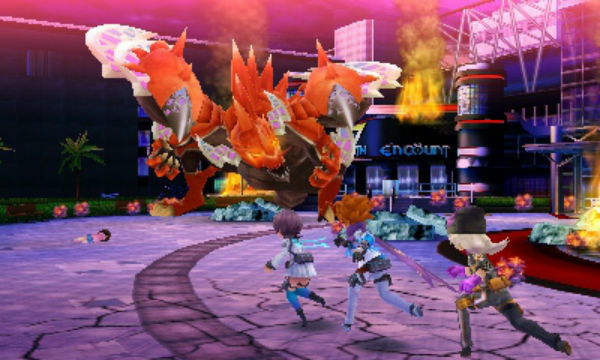 The 3DS seems to be entering its twilight years on the strength of RPGs, and 7th Dragon III isn't simply the end of its own saga — it's a great beginning to the final chapter of the 3DS's tale as well. There's a lot to juggle in the menus, but the game takes pains to make itself accessible and minimally frustrating. A pro RPG fan could critical path it in about 25 hours, but with side quests, dragon hunting, dating, and visits to the cat cafe, you're likely to clock in about twice that. Four words: "Soundtrack by Yuzo Koshiro." Play it loud. A gorgeous game. Even if you don't like the character designs, the detailed environments and artful use of color are unrivaled. Despite some combat balancing issues and some occasionally too-linear design, 7th Dragon III offers a top-class portable role-playing experience. Thankfully, you don't need to be familiar with the unlocalized earlier games in the series to grasp the story, and its wealth of customization options make for a fairly breezy RPG experience... at least until you get to those brutal True Dragon fights, anyway. Tagged with 7th Dragon III Code: VFD,	Atlus,	Nintendo 3DS,	Reviews,	Role Playing Games,	Sega.